Vehicle swept path analysis is an essential evaluation known in the architectural, civil engineering, and construction industry. It allows designers to simulate and visualise any scenarios involving vehicle access and circulation; thus, minimizing operational inefficiencies or costly reconstruction of the geometric or infrastructure design. Yet finding a tool for this analysis can be challenging for many reasons. For instance, designers have to choose from a limited number of CAD platforms in order to use this functionality in the past. If their preferred platform is not supported by AutoTURN, it could mean additional costs to the designers to purchase a supported platform first. Moreover, it can be a problem when teams are trying to collaborate and professionals that could be reviewing designs are not able to quickly evaluate the scenario without being limited to working within a particular CAD environment. Finally, the results of the analysis needs to be reliable. Not every swept path analysis tool on the market is made the same where it is intuitively designed and produces high quality trusted results backed by field tests and on-going research. Today, there is a solution. Transoft’s AutoTURN Online is a new addition to the AutoTURN product family that does not require a CAD program to function. As it’s cloud-based, there’s nothing to install, available at anytime and anywhere via an internet browser – not tied to a workstation. This makes it accessible to many designers regardless of their CAD platform of choice. 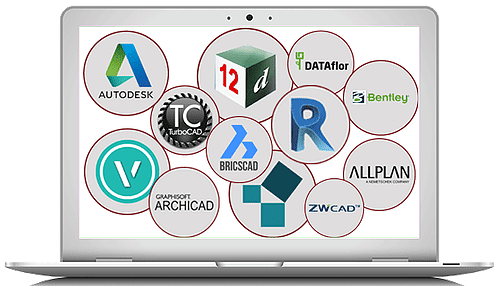 This includes SketchUP, Vectorworks, Archicad, Pythagoras, AutoCAD LT and many more. All designers have to do is export their work in the universal ‘.dxf’ file format and import it into AutoTURN Online to begin. Alternatively, they can even import an aerial image for analysis. Once loaded, designers can perform a full range of vehicle swept path analysis activities, simulating reversing and forward turning maneuvers for any scenarios like roundabout navigation, trailer docking and parking in tight spaces. 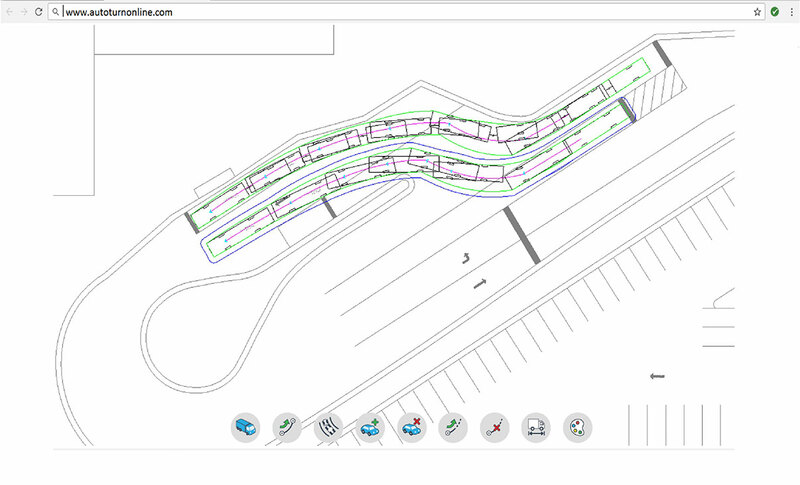 With hundreds of vehicles to choose from, including cars, buses, semi-trailers, emergency, and construction vehicles, designers can visualize the swept path for the vehicle body envelope, tire tracks, and safety clearances. Simply subscribe to the vehicle library bundles appropriate for your project on an annual or monthly basis. It’s easy to add more vehicles later on when the project needs arise. Then, once the simulation work is complete, designers can export the simulation results as ‘.dxf’ files and import them back to the original platforms, whether they are using a PC or a Mac. Drawings that are saved in AutoTURN Online are secured stored. You can take AutoTURN Online for a test drive at www.autoturnonline.com. A free 7-day trial is available upon registration.